Ailsby Collection: SS Marksmen Badge. 2nd class, 1st class, Sharpshooter, Master Shooter Class. Rarity – Rare, Rare, Extremely Rare. Master Shooter Class - Reverse. 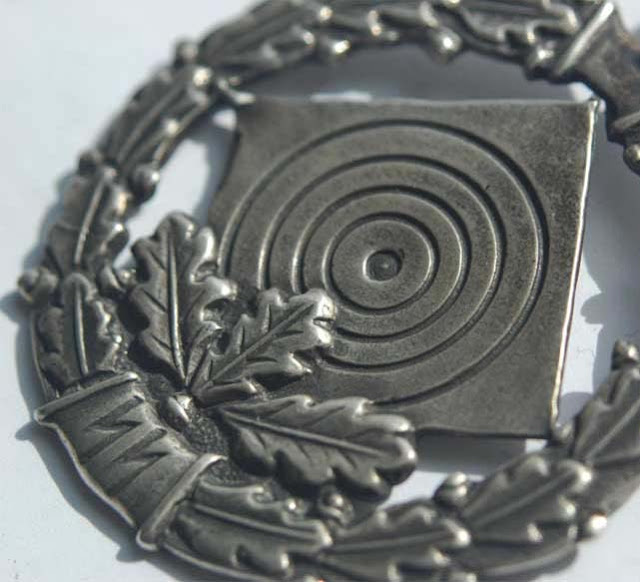 This award comprises of a round badge that measures 34 mm in diameter. It is formed as an open circle of oak leaves that are formed in a wreath. At the base and apex are identical ribbons that measure respectively 9 mm and 7 mm. these have raised edges that measure 1 mm. the ribbon at the base has the SS Sigrunen which are incused. From this on either side are six over lapping oak leaves. This circle is 6 mm wide. Into the centre of the wreath is placed a square on its point. Incused into this at its centre is a 5 ringed target. In the case 2nd class, a square on its point with target and no oak leaves. In the case of the1st class, Sharpshooter, from the base ribbon is a pair of oak leaves one on either side of the ribbon. The reverse is flat with a pin hinge and hook construction. Onto the target in raised letters is Ges. Gesh. At the centre is the raised square box with cut corners and the SS Sigrunen. 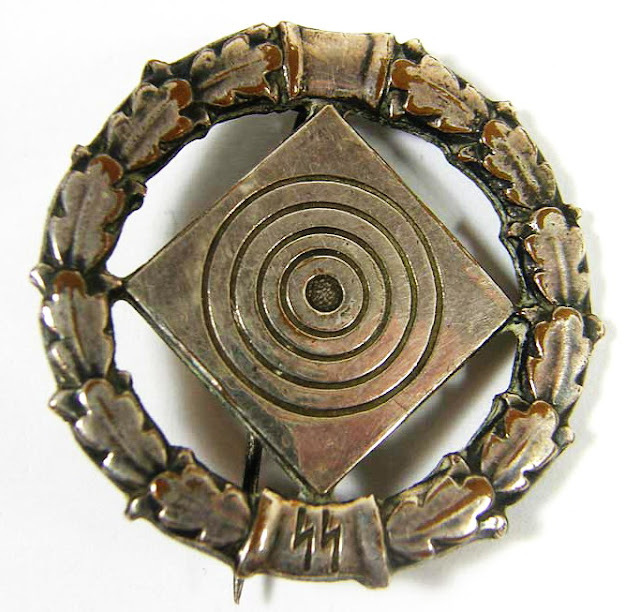 The question of an award for marksmen in the SS first arose prior to the end of 1936. Members of various branches of the SS had no insignia to show marksmanship qualifications. Several members of the SS-Verfügungstruppen returned from their periods of conscript army service with a marksmanship lanyard gain during their time in the forces. Were they to be allowed to wear this on their SS uniform? On 13th October 1936 the Chief-of-Staff of the SS-Oberschnitt Elbe asked the SS-Hauptamt if it would be permitted for personnel returning from service in the armed forces to wear their marksmanship lanyard (Schützenschnur) on their SS uniform. Himmler ruled this out, and the decision was made not to allow the wear of the lanyard, but rather to allow the wear of the older shooting awards utilising a series of bars and chevrons worn prior to June 1935 by the army. These were to be worn on the lower left cuff of the SS service dress tunic. 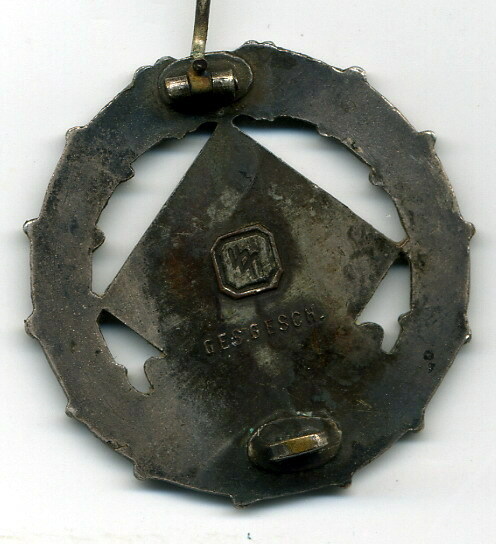 Himmler then ordered that a metal badge to be known as the Schützenabzeichen der SS-Verfügungstruppen be created. 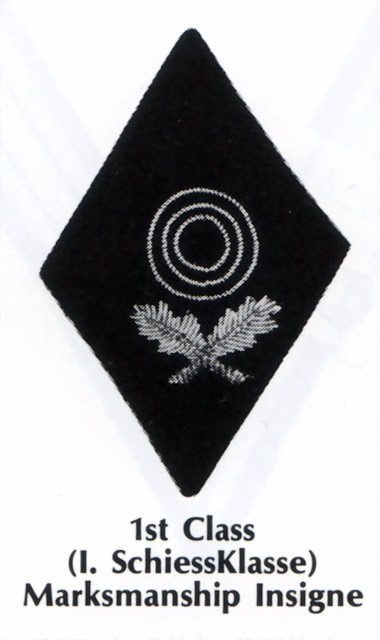 This would be worn on the right breast pocket of the tunic with parade, re-porting, guard and walking-out dress, but not with field and training dress. The order instituting this award is rather vaguely worded, but it states that, “The lowest grade shall be without a lower oak leaf.” The middle grade will have “two lower oak leaves.” The highest, or sharpshooter, grade 2 will have three oak leaves.” The grouping within each grade will be indicated by a numeral I to 10 at the top of the wreath. Himmler appears to have dropped the idea. He writes, “The SS will receive as its marksmanship award the marksmanship award of the NS Reichskriegerbund. This concept was even shorter lived. 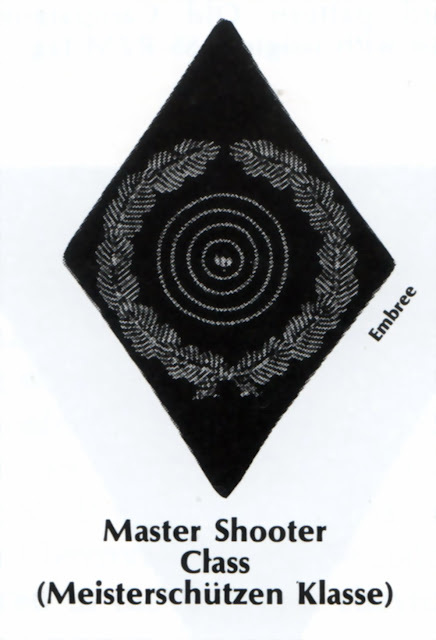 In November 1937 an order instituted a totally new series of marksmanship insignia in four classes to be worn on the lower right sleeve. The insignia was aluminium on a black wool diamond. 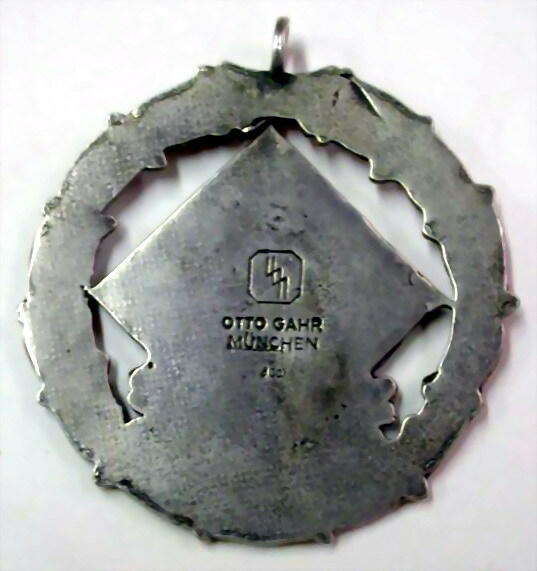 The metal badges were manufactured in the work-shops of the München silversmith Otto Gahr at an individual cost, including engraving of 0.74 RM per thousand. SS Marksmen Badge 2nd class. 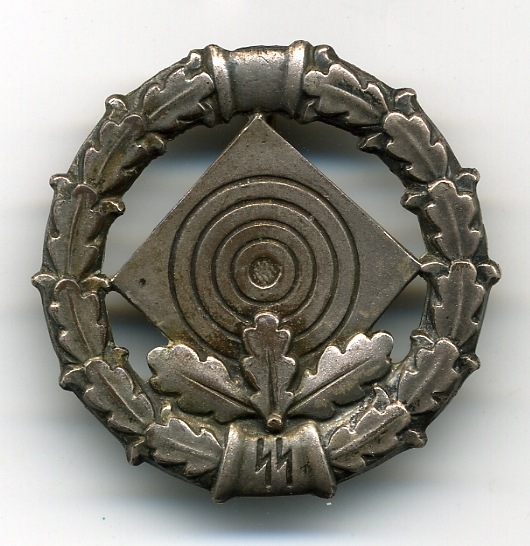 SS Marksmen Badge - FAKES. 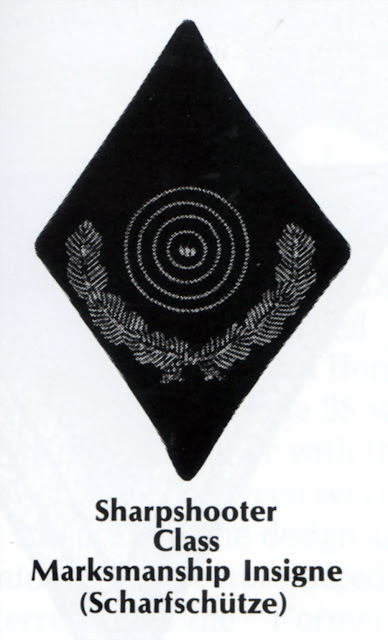 In November 1937, an order instituted a totally new series of marksmanship insignia in four classes to be worn on the lower right sleeve. 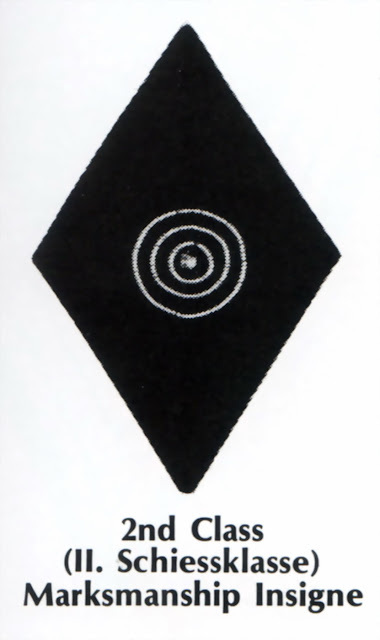 the insignia was produced in aluminum wir on a black wool diamond.